Claws of Furry is a brawler game, which features four ninja cats trying to save their old master. The game was developed by an independent studio Terahard. 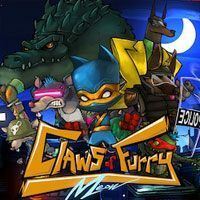 Claws of Furry is a mix of a brawler and rogue-like experience created by an independent developer, Terahard. A group of young cats finds themselves under the protection of an old master, who specializes in a martial art based on elements of ninjutsu. Their new guardian trains the young ones until, one day, he gets kidnapped, leaving the protagonists in a difficult situation. Now, their mission is to save their master. Claws of Furry is an incredibly dynamic brawler, a game in which players are focused on eliminating enemies in melee combat while traversing the game world. The player controlled, small characters dressed up in ninja costumes dispose of enemies using their claws. They can also avoid, jump, and dodge attacks and incoming projectiles. On their way, they encounter groups of enemies like crocodiles or rats. There are fifty levels in the game, which are divided into four visually distinct worlds. Over the course of the game, players unlock many bonuses, e.g. new costumes granting unique buffs. The game features a typically rogue-like feature of a randomized level pool, making each playthrough different. The game can be enjoyed solo or in co-op mode with a maximum of four fiends (both local and online). For the players who don’t like rogue-like games, the developers included a Pussycat mode. It offers a more linear experience and includes checkpoints, which are missing in normal mode. The graphic design in Claws of Furry is colorful and fully 2D. The backgrounds were hand-drawn. The animation of the characters – both friend and foe – is fluid and pleasing to look at.